She is an elderly Indian lady, and poor. You can tell that she has had a tough life. Standing and staring. 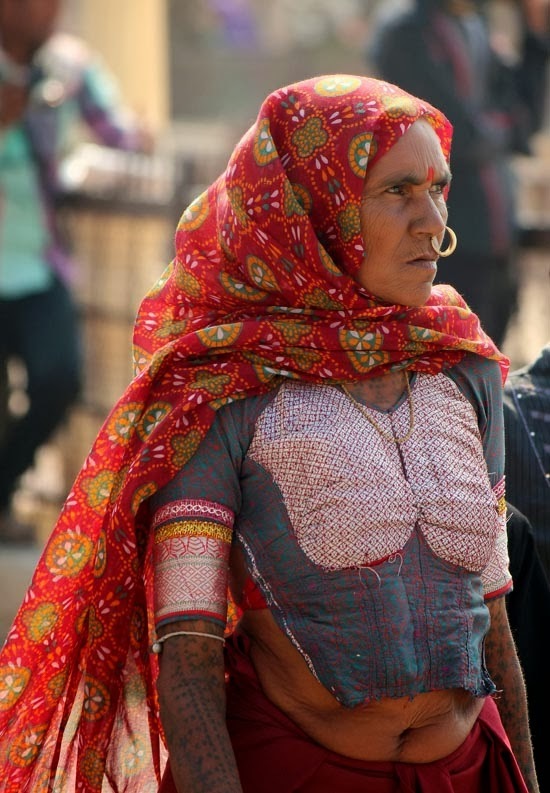 Wearing her traditional Gujarati dress she was seen on the Somnath temple grounds in Gujarat. Gujarati women wear colourful clothes as opposed to the dull whites and blues of the Gujarati men. This woman is wearing a nose ring and has a large tikka on her forehead. The bright red and green (traditional colours of Gujarati textiles) pallav is covering her head. Her arm is tattooed, common amongst tribals. Her son is by her side. By the looks of him this woman could not be more than fifty, but looks older due to the hard life and exposure to the sun. Or is he her grandson? Or check out the scores of photographs of Indian Women on this blog.